*Note that concealed carry is allowed via permit. Montana does not have gun registration, licensing, or owner permits. There is no assault weapon ban or magazine capacity limitations. Private gun sales are legal. Open carry is legal and concealed weapon permits (CCW) are shall issue. Permits are generally not required outside of city/town limits. It is legal for a person who is outside the city/town limits or the confines of a logging, lumbering, mining, or railroad camp or who is lawfully engaged in hunting, fishing, trapping, camping, hiking, backpacking, farming, ranching, or another outdoor activity in which weapons are often carried to carry a concealed firearm, 45-8-317(i). Concealed carry is illegal in portions of a building used for state or local government offices and related areas in the building that have been restricted, 45-8-328(a). Local governments may prohibit carrying of concealed or openly carried weapons to a public assembly, publicly owned building, park under its jurisdiction, or school (and many do) 45-8-351. No guns signs do not have the force of law on private property. Failure to leave or disarm would only be trespassing. Banks and establishments that serve alcohol, which may be posted, are regulated separately. Hotel owners are prohibited by law from banning firearms, 70-24-110. You may not carry a concealed firearm a in an establishment that serves alcohol on the premises (bars and restaurants), 45-8-328. It is illegal to carry a concealed firearm while under the influence of an intoxicating substance, 45-8-327. This does not apply to open carry​, however many establishments are mistaken about the law. Concealed carry is prohibited in a bank, credit union, savings and loan institution, etc. during normal business hours, except when using a drive-through, ATM, or depository, 45-8-328. This does not apply to mall or grocery stores with bank kiosks unless one goes into the actual banking area. This does not apply to open carry. Firearms are prohibited in school buildings except that school trustees may give permission to carry, 45-8-361. Parking lots and outside the school are not covered by this section. 45-8-351 allows local governments to prohibit firearms at schools as well. No specific state law prohibits firearms on college or university campuses, but educational authorities ban firearms and a bill to allow concealed firearms on campus failed in the 2015 legislature. There is no law prohibiting loaded or unloaded firearms in vehicles. Unlike other states, there is no wildlife regulation on loaded long-guns. Weapons cannot be concealed upon the person within city/town limits (see permitless carry). It is illegal to carry a firearm on a train unless the weapon is checked as baggage, 45-8-339. There is no specific law prohibiting firearms in airports, however local governments can ban firearms in public airport buildings 45-8-351. National Forest and Bureau of Land Management (BLM) lands in Montana have no ban on the carry of firearms. Firearm carry on Indian reservations is a gray area. 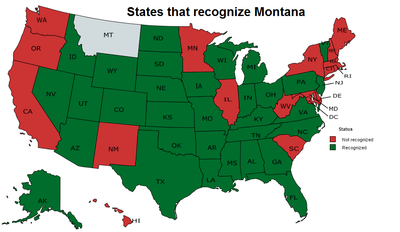 Some reservations in Montana do permit concealed carry with a valid concealed firearm permit, however, it may vary. Tribes cannot enforce tribal law on non-tribal members, though they can enforce state and federal law. You may be trespassed from the reservation and have your firearm confiscated. One should contact individual reservation authorities for clarification of their regulations. Local governments can prohibit firearms (openly carried or concealed) in government buildings, public assemblies (appears to be interpreted as public meetings and large events), parks, and schools. Otherwise, they can only regulate unsafe discharge of firearms and ban firearm possession by convicted felons, adjudicated mental incompetents, illegal aliens, and minors (already illegal). Check local ordinances, especially park regulations as park rules or signs may not be conspicuously posted. State law makes it illegal to purposely or knowingly purchase a firearm after the person has been convicted of felony, 45-8-313. Violators of this section may be sentenced to lifetime supervision by the state for the purpose of restricting the person's right to purchase and possess firearms, 45-8-314. Active supervision by a probation or parole officer is not required but may be imposed by the court. Violators may apply to the district court for the county in which the person resides for a permit to purchase and possess one or more firearms. This provision would conflict with federal law. All citations Montana Code Annotated (MCA) unless noted.